We would like to highlight those destinations in which you can experience Baja’s untouched scenery, and where operators show an approach to the tourist development based on sustainability and respect for the environment. 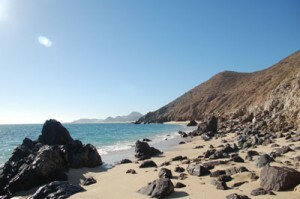 The first eco-tourist destinations south of Tijuana down the Baja Peninsula are the Sierra San Pedro Martir and the small town of San Quintin, home to Bahia Santa Maria, one of the largest bays on the west coast of Baja. San Pedro Martir hosts Baja’s most notable National Park, with the highest mountains of the region and the National Astronomical Observatory at the University of Mexico, built at an altitude of 9,285 ft (2,830 meters) above sea level, and equipped with a large telescope with a diameter of more than 7 ft (2 meters). The highest peak is the Picacho del Diablo (Devil’s Peak, 10,170 ft), a favorite destination for hikers, rock climbers and rappel enthusiasts. The whole park offers many adventure opportunities, like mountain biking, trekking, horseback riding and camping. Wildlife lovers have the opportunities to meet mountain lions, condors, desert bighorn sheep, coyotes and eagles, in a landscape of pines, cypresses and aspen trees. You can hire guides to explore the park, and admire the fantastic views from its peaks, stretching from the west to the east coast of the peninsula. About 60 miles southwest of the park, you will reach San Quintin, a small town famous for boating, fishing and digging clams, which also offers a good opportunity to fill the car with gas and the wallet with cash at the local bank. The town is not a big tourist center, although you can find some anonymous motels along the trans-peninsular (but very handy in case you are just breaking-up your bus / car journey on your way south from the border), and there are some more picturesque hotels and restaurants on the beach. The bay and its inner lagoon are home to a myriad of different birds migrating there from North America, making San Quintin a good spot for bird watching and wildlife viewing. Fishing lovers will not be disappointed either, as they can find a few fishing clubs hiring boats and organizing trips. The town heritage is quite curious, as there is a strong English influence, due to a big settlement at the end of the 19th century. A few English families moved into this area and there are still some old colonial buildings in the area known as the Old Dock (Muelle Viejo). The Santa Maria beach is a good place for water sports, and for wind and kite surfing. Please note that the beach is quite far from the highway, and you need a car to reach it through the dirt roads and swamps.